As there is a saying, when one door closes another one opens. Yes, that’s how life is and this book of mine is just like that as I make progress on its release. Me and my friend we are working very hard to put together this book of mine. It’s like a baby who is growing each day and making progress towards that day when the baby will walk…yes that’s how I feel about this book of mine. This is the cover page of my book and I want to see what do my friends see when they see the cover of this book :). This could be one of your eye test 😉 …lol! 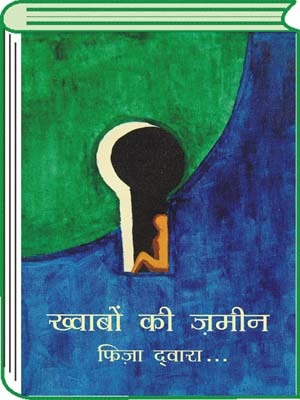 Well the title of this book is ‘Khawabon Ki Zamiin’ meaning ‘Land of dreams’; as I feel this is the land where we dream and we also make our dreams come true. This book consists of all my poetries belonging to my childhood, my teenage mind and heart and the youth where I feel others pain and injustice and wants to voice that to all…! As I said this is my first effort and with my friends encouragement I could give this baby a birth :). I do want to mention about the cover page painting yes, its one of my dear relative and friend who is witty and yet naughty but then his imagination on the canvas made me to choose this painting of his 😉 and his name is Jagadish Bhaskar Pakravoor. I thank all my friends for their blessings and prayers and also to my friends who are helping me in releasing this book :). The draft of my book is almost done and is in the preparation of releasing it.